Wally was born in Winnipeg to George and Mary Berry (nee Vance). He spent his early years there until the family moved to Calgary in 1930 and on to Edmonton in 1939. He enjoyed all sports as a boy and played hockey with the Canadian Athletic Club in Edmonton. He joined the Air Force in 1942 and after serving in Canada and overseas, he was discharged in 1945 with the rank of Flying Officer. In 1944 he married Ruby Brownridge at Robertson United Church and they were blessed with two daughters, Rosslyn and Rhonda. In 1946 Wally joined Alberta Poultry Producers which later became Lilydale Cooperative Ltd. 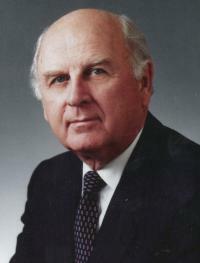 He became CEO in 1958 and led the organization until his retirement in 1989 having made it into the largest poultry producer and marketer in Canada. In 2008 Lilydale opened the “Wally Berry Research Building” in honor of his guiding the company through its major growth from 1958 to 1989. He enjoyed his retirement with his horses and carriages and Driving competitions, cottage life at Pigeon Lake and travels around the world. Wally was predeceased by his wife Ruby (1985), his brother Vance and sister Marelle Gordon. He leaves to cherish his memory his daughter Rosslyn (David) Edgar of Westerose, Alberta, granddaughter Daryn Edgar of London, England, grandsons Geoffrey (Heather) of St. Albert, Craig (Sarah) of Summit, New Jersey and Graham Edgar of Edmonton. Daughter Rhonda (Gilbert) Thompson of Ardrossan and great grandchildren, Benjamin, Griffin, Skylar of St. Albert, Sadie, Charlie and Samuel Edgar of Summit, New Jersey. Nephews, Gilbert (Connie) Berry, George Berry, Richard (Sharon) Berry all of Edmonton and nieces, Janet (Paul) Smith (nee Gordon) of Kanata, Ontario, Gary and Pam Stahl (nee Gordon) of Rolling Hills, California and Tony and Diane Tarrant (nee Gordon) of Calgary. The Family would like to extend many, many thanks to Sabina, Maria, Liza, Madel, Rhea, Edna, Riza, and Romeo at Willow Cottage for the care and attention paid to Wally and making his final days as comfortable and peaceful as possible. Cremation has taken place. A Memorial Service will be held at the Chapel at Foster and McGarvey, 10011 – 114 Street, Edmonton on Thursday, December 4, 2014 at 2:00 p.m. In lieu of flowers, donations would be greatly appreciated to the Global Foundation for Peroxisomal Disorders, 5147 South Harvard Avenue, Suite 181, Tulsa, Oklahoma, USA 74135 (http://www.thegfpd.org/donate/make-a-donation#sthash.JL4ruJpP.dpuf).